LOS ANGELES -- European Council officials investigating vaccine industry corruption and media frights that prompted governments worldwide to over-stock risky H1N1 vaccines and expensive drugs for the unusually mild "2009 swine flu pandemic" have a Special Reportonline in Medical Veritas to consider. "Pharmaganda: A Study of Conflicting Interests," by Editor-in-Chief Dr. Leonard Horowitz, and investigative journalist Sherri Kane, evidences a virtual monopoly by Reed-Elsevier over scientific publications empowered by ChoicePoint, a leading intelligence organization and census data company serving organized crime. Vast corruption of medicine is administered by persuasion through health science publications according to the authors who indict The Lancet--an esteemed medical journal--and other Reed-Elsevier periodicals for gross conflicting interests. The Lancet is among 2,000 science journals published by the Reed-Elsevier-ChoicePoint conglomerate. The UK-based company sells more than 250,000 articles annually. Through its vast network of publications, combined with ChoicePoint's "intelligence services," control over scientific knowledge and medical practices are certain and have become disastrous. Medical intelligence and health practices have been monopolized and corrupted to the detriment of world health and every doctor and patient. ChoicePoint was purchased by Reed-Elsevier in 2008 for $3.6 billion in cash. The conglomerate is a "prime intelligence service" supplying governments and multinational corporations with genetic and demographic data, including confidential social security numbers and voter records. The company is best known for administering the corrupted data used to certify George Bush' s contested 2000 presidential election. Reed-Elsevier's archives contain seven million publications read by doctors and scientists whose faith in their "intelligence" is fundamental to every aspect of public policy and governmental decision-making. The impact of this corruption of information, censored studies, and promoted pseudoscience, is shocking. Social progress in general, and public health policies in particular, are sabotaged by this breach of faith, ethical misconduct, and manipulation of basic knowledge needed to serve humanity in every way. Total yearly downloads of Reed-Elsevier's articles alone amount to 240 million. Multiply that times $30 per download and you get more than $7 billion annual income. "Who's making the money?" Dr. Horowitz's commentary asks. BigPharma mainly. The cartel operates in direct violation of international anti-trust laws and the American Sherman and Clayton Acts--actions punishable by hefty corporate fines and prison times for lawless officials. Civil and criminal complaints may be brought by damaged plaintiffs and states' attorneys as is happening across Europe. 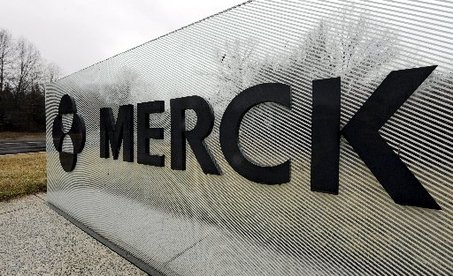 Relatedly, the leading vaccine maker, Merck & Co., was sued in Australia after Merck paid Elsevier to publish the Australasian Journal of Bone and Joint Medicine. The periodical appeared to be a peer-reviewed academic journal, but only contained articles promoting Merck's drugs. Merck first denied claims that the articles in this "complimentary publication" were authored by Merck's ghost-writers. Company officials defended saying all reprints came from peer-reviewed medical journals. Elsevier later conceded stating their "sponsored article compilation publications" are produced "on behalf of pharmaceutical clients," and "are made to look like journals." The company admitted fooling doctors and patients alike by neglecting the "proper disclosures." Besides corrupting medicine the Reed-Elsevier-ChoicePoint's medi-media-monopoly controls the vast demographic data used by Anglo-American governments and corporations, including the U.S. Federal Census data used to administer Medicaid/Medicare and advance "Health Care Reform." In 2006, the company was fined $15 million by the Federal Trade Commission (FTC) for selling data, including confidential social security numbers of 163,000 citizens, to a crime ring according to court records. Reminiscent of Rockefeller-Third Reich eugenics policies, ChoicePoint collects genetic data used to classify and identify people for law enforcers. Besides supplying British and American "intelligence" organizations, including the FBI and CIA, the private entity conducts background checks for more than half of America's 100 largest companies, including many major retailers, the Bank of America, UnitedHealth Group, and United Parcel Service. "Conflicting interests damagingly taint health science and medicine, " the authors report. Pharmaceutical propaganda facilitates geopolitics and economics most obviously evidenced by the manufactured H1N1 pandemic. In this regard, social conditioning, governmental legislation, and health care policies and purchasing have been profoundly impacted by the 'Pharma-media'." Fox News defector Sherri Kane previously disclosed links between western world media leaders Rupert Murdoch and Thomas Glocer, controlling News Corp., the Associated Press, and Reuters News Service, and the H1N1 vaccine makers Merck/CSL and GlaxoSmithKline. Specious safety testing was performed on pregnant women and children in Murdoch family controlled facilities in Australia. James Murdoch, heir apparent to the Murdoch fortune, oversees the Board of Directors of GlaxoSmithKline. Glocer, chief of Reuters, is on the Board of Directors of Merck. Combined, these candidates for a Nuremburg Trail, control the western world's mass mind, are largely accountable for billions of dollars of governmental misappropriations for worthless stocks of vaccines, and equally answerable for every person sickened or killed by the fraudulent H1N1 vaccine campaign. 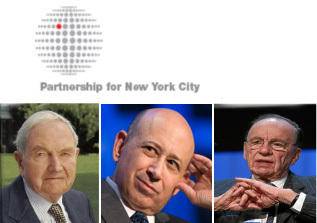 Kane revealed Murdoch's co-chair in the Partnership for New York City (PFNYC), Lloyd Blankfein of Goldman Sachs, merged MedImmune and Astrozeneca to retain a substantial share of profits from selling FLUMIST. This nasal spray vaccine contains "live" active" H1N1 genetically engineered viruses that experts say can alter DNA. Thus, every vaccinated human adds to the risk of civilization's extinction due to more and more genetic mutations yielding riskier recombinations with the human genome and more deadly circulating viruses. In light of this obviously "hostile takeover" of health science and medicine affecting care providers and consumers worldwide, Horowitz and Kane urge independent investigations of the corporations driving centralized international governance, World Health Organization regulatory powers, and a new global society that marries eugenic theology with advanced biotechnology. 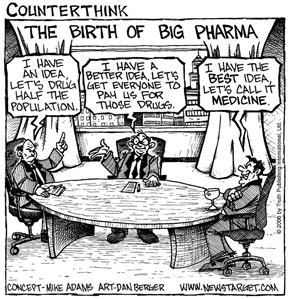 The 'genetopharmaceutical' industry, they conclude, "obviously builds new markets by poisoning populations with new vaccines and drugs containing biochemical mutagens." This alert compels medical doctors to consider Reed-Elsevier publications as extremely tainted sources of potentially lethal "intelligence." "If journals advertise for BigPharma," Ms. Kane warns, "they are guilty by association of pulling the wool over everyone's eyes using illegitimate science and fear-based propaganda to push unsafe and generally ineffective vaccinations and drugs. These publications violate the medical Hippocratic oath. They do more harm than good, and kill more than protect." The editors of Medical Veritas urge governments investigating corruption in health science to study suppressed alternatives to vaccinations, and new water purification, oxygenation, and alkalinizing methods freeing people and environments from drug toxicity, petrochemical pollution, genetic mutations, and threatened omnicide. NOTE TO JOURNALISTS: Here is a courtesy copy of Medical Veritas, available free for online review for only 30-days from the date of this release: CLICK HERE for this commentary and link to "PHARMAGANDA: A Study of Conflicting Interests." 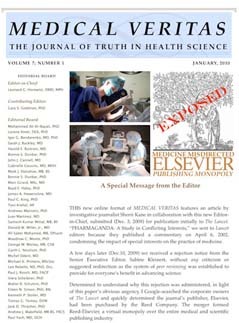 After February 15, 2010, there will be a $35 charge for accessing this issue via pdf download, with individual articles in this issue available for separate purchase at $15 per download, including Dr. Harold Buttram's important article on the future of human DNA corrupted by the mutagenic viral injections accompanying childhood vaccinations. Please help alert medical doctors about this report, and this free limited time access. Medical doctors and patients must be informed that their intelligence has been tainted by pharmaceutical special interests. This publication contains urgent life-saving knowledge.